In South Yorkshire there will be many Eritrean, Somali, Sudanese and other migrants mourning the deaths of friends and family off the coast of Lampedusa recently. We send our condolences and our hope that such loss is not inevitable in the future. Two years ago SYMAAG organised a film showing and public meeting at Sheffield University. We invited Bereket Kahsai of the Eritrean Community Organisation of Sheffield and Dr Abdelbasit Gadour, recently appointed Cultural Attaché of the Libyan Embassy in the UK to address the question: “After Gaddafi: will life improve for African migrants in Libya?” The recent deaths of hundreds of African migrants near the Italian coast at Lampedusa; the renewal of deals between the European Union to establish ‘external border controls’ in Libya and other north African states and a recent Amnesty International report on asylum seekers in post-Gaddafi Libya suggest not. While the hundreds of people who died off the coast of Lampedusa are granted post mortem Italian citizenship, public prosecutors are planning to charge the survivors with ‘illegal migration’. In an excellent article published in El País on 5 October entitled “Only the Dead Can Stay”, Pablo Ordaz explains how this absurd situation was made possible by the criminalization of illegal migration in Italian law. Can irony get any more bitter than this? In a recent cartoon by Patrick Chappatte, two border guards are standing on a beach next to the European flag, looking out on a half-sunken shipwreck surrounded by floating corpses. They just pulled a dead man ashore, who is lying on the beach. While they look at him, one border guard says to the other “He drowned before we could do anything to expel him”. In his article, Pablo Ordaz exposes the hypocrisy of the proposal by Angelino Alfano, the Italian deputy Prime Minister, to award the Nobel Peace Price to (the inhabitants of) Lampedusa, while many inhabitants and rescuers have become traumatized by the consequences of legislation that criminalizes helping migrants in distress. Several deaths could probably have been prevented. Ordaz wonders why it took Italian Coast Guard longer than two hours to find out that a ship carrying more than 500 people was burning and sinking just half a mile from the island, and why it took so long (one hour) to actually come to the rescue after they had been alerted by local fishermen. To make matters worse, Ordaz reported that the authorities initially refused to help local fishermen in their efforts to rescue people. A local fisherman, who arrived first at the site of the accident, said that coastguard officers wasted time filming the rescue operation. He told reporters that “They refused to take on board some people we’d already saved because they said protocol forbade it” (see here). As Ordaz points out, Italian authorities actually have the right to stop people who want to rescue migrants at sea since ‘complicity with illegal migration’ was criminalized in 2002 by the Berlusconi government thanks to the pressure by the xenophobic Lega Nord party. More generally, this shows the dangers of criminalizing migration, which has been a trend in several European countries. 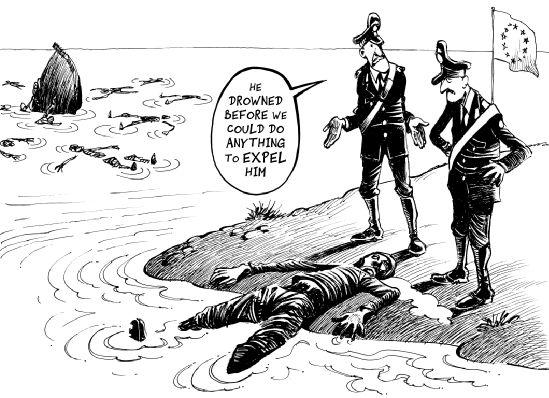 Instead of solving a problem, criminalizing migration has made matters worse, as it increased the risks that migrants and refugees have to take and their dependence on smuggling, and it decreases the chances of getting rescued if they find themselves in perilous situations because people are afraid to get prosecuted for assisting ‘illegal migrants’. Deeply embarrassed by the Lampedusa tragedy and the concomitant media attention, Italian lawmakers announced they want to amend immigration laws by withdrawing elements that criminalize irregular migration. However, given their past track record, it remains to be seen how long Italian and other European politicians will be able to resist the perverse temptation to be ‘tough on immigration’. In fact, we can already see the first signs that the Lampedusa disaster will be cynically abused as an argument to further reinforce border controls and thus to further boosting the budgets of the relevant ministries and international agencies and organisations such as Frontex (the European border agency) that are often asked to carry out such policies. Over the past few days, several European politicians professed their their profound sadness about what happened and the Lampedusa deaths were officially mourned by observing a moment of silence in the European Parliament on 8 October. However, in the same breath several politicians added that this tragedy showed that the ‘fight against illegal migration’ should be intensified’. Such statements ignores the criticism on the initially rather lax attitude of Italian authorities, who, by several accounts, could have saved more lives if they had reacted much faster and more efficiently. It is not the authorities, but the fishermen, divers and inhabitants of Lampedusa who deserve the praise. However, what is particularly worrying is the constant recycling of the myth that an intensification of ‘combating people smuggling’ is a solution to the problem, while it is in fact part of the problem. People smuggling is a reaction to border controls, not the cause of migration. Lampedusa shows us the sad state of affairs after 20 years of ‘fighting’ a delusional migrant ‘invasion’. Several studies have shown that increasing border controls have not stopped but rather diverted trans-Saharan and trans-Mediterranean migration routes, as they have done elsewhere in the world. Border controls have forced migrants and refugees to travel along more dangerous routes and have made them dependent on smugglers, who facilitate border crossings. Even stricter border controls will boost the profits smugglers can make and will cause more migrants and refugees to risk their lives on perilous, long crossings on unseaworthy boats. European leaders should therefore stop shedding crocodile tears on the Lampedusa disaster as long as they keep on pumping ever more money in border repression. If the concerns of European leaders and international organisation are genuine, they can show this by respecting their obligation to uphold international humanitarian and refugee law. Second, this implies that governments should give asylum seekers full access to refugee status determination processes and, during this procedure, give them access to proper shelter and protection instead of locking them up in prison-like border camps or detention centres under appalling conditions. Third, with regards to irregular labour migration: If European governments are genuinely concerned about the exploitation of irregular migrant workers in European workplaces, they should create more legal channels for lower skilled migrant labour for which a real demand exists (as recently argued by EU Home Affairs Commissioner Cecilia Malström), to regulate labour markets and target employers who abuse migrants’ irregular status instead of criminalizing migrants. Fourth, this means that European governments should stop encouraging North African countries such as Morocco and Libya to flagrantly abuse migrant and refugee rights, as they have done over the past two decades. This includes suspending most programs for so-called ‘assisted voluntary return’ which may be well-intended but often serve to justify the violation of migrant rights by North African governments. These policies have not only caused widespread suffering, but have only encourage migrants and refugees who initially considered these countries as destinations, to move on to Europe. Such a policy shift can only happen if European leaders have the courage to explain to European citizens that they are not dealing with a migration flood or plague of biblical proportions, but with a humanitarian issue of considerable, but manageable size. This would signify a radical break with the past years, in which European leaders have done their very best to abuse ‘migrant tragedies’ such as in Lampedusa to create a ‘myth of invasion’. For instance, in 2011, Italian Foreign Minister Franco Frattini warned that Europe may suffer an influx of many as 800,000 refugees if the Ghaddafi regime would fall. 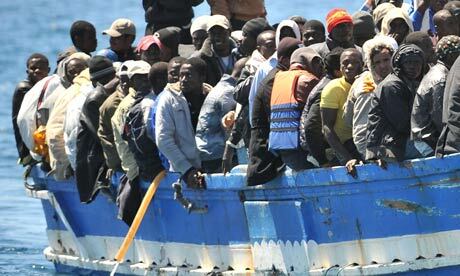 Some politicians even predicted that up to 1.5 million Africa migrants would come to Europe as a consequence of the Libyan conflict. Eventually, only a few thousands of refugees arrived in Europe as a consequence of the Libyan conflict, as most preferred to return home. While organisations such as Frontex have a clear material interest in inflating the ‘invasion’ myth, for national politicians creating such an ‘external enemy’ can be an effective strategy to deflect attention away from thorny domestic issues. Recycling of this misleading ‘myth of invasion’ may be politically convenient but undermines popular support for sensible policy reforms that will guarantee the protection of migrant and refugee rights on the European borders. European policy making on this issue is caught up in a vicious circle of ‘tougher border controls -> higher risks of migrating -> more dependence on smuggling -> more deaths –> tougher border controls, and so on. This is a dead end. However, as with any crisis, the Lampedusa disaster can also be used as an opportunity to change for the better, as an opportunity for European politicians to show leadership and gather up the courage to explain citizens that we are not dealing with an invasion, that the repressive policies of the past have failed (or, at the very least, that they have reached their limits), that they have the obligation to give protection to those fleeing conflict and persecution and that they can no longer allow to let people die at the border. As more and more people flee the war in Syria, a small number of refugees have managed to reach Europe, seeking sanctuary. Around 65 Syrian refugees are staging a blockade of the Calais ferry terminal, demanding to speak to a representative of the UK Home Office. Some are on hunger strike. Last month at the G20 meeting in Saint Petersburg, David Cameron said that responding to the war and displacement in Syria was “…a moral imperative. This is the big refugee crisis of our time.” And yet the UK refuses to offer sanctuary to Syrian refugees. It’s time that the UK government’s rhetoric on the Syrian war was turned in to action. 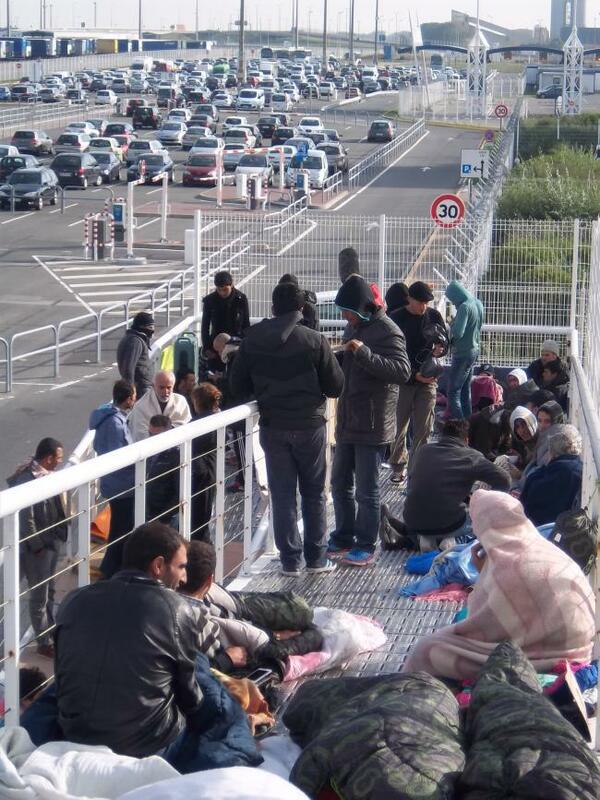 UK call out: Campaign for Syrian refugees blockading port of Calais. 65 Syrian refugees have been staging a blockade of the Calais ferry terminal for over ten hours now, demanding to speak to a representative of the UK Home Office. Some are on hunger strike. After fleeing shelling and persecution in Syria, the refugees endured further brutality in Europe. In the small French port town they have been subject to evictions from emergency shelters, destruction of possessions and repeated arrest. The blockaders have therefore resorted to direct action to have their voices heard. They are refusing to leave until their demands are met. In a town where the police act with considerable impunity on a daily basis, it is important that the blockaders receive solidarity from beyond Calais in publicising their demands.